If ball joints are allowed to degrade to the point of failure, it can lead to a wheel separating from the vehicle while driving. That is... not good. The Dodge Ram that I bought a few months back ended up having some loose joints up front, and I certainly didn’t want a nightmarish scenario like that to unfold. Here’s how I fixed it. Ball joints are critical to the handling and overall safety of your vehicle. They aren’t exactly components that should be stretched to their maximum lifespan. When they start to wear, audible clunking can sometimes be heard from the suspension and the steering often feels sloppy from behind the wheel. These are parts that should be checked regularly and replaced at the first sign of looseness. They’re also a fairly frequent wear item on these Rams, especially on the trucks equipped with the 1,100-pound Cummins diesel engine. That power plant puts lots of stress on the front end. The joints have to deal with that enormous heft every time a pot hole is struck, a turn is navigated, or the brakes are applied. I couldn’t blame the joints for needing replacement, especially with over 270,000 miles on the truck. However, during my inspection of the ball joints, I discovered something I simply couldn’t believe: the joints were riveted to the suspension arms. Now I’ll admit I haven’t replaced a ton of ball joints in my life. I went into this fully expecting the joints to be a “serviceable” part on the truck, similar to every vehicle I’ve worked on in the past. Well, so much for that. 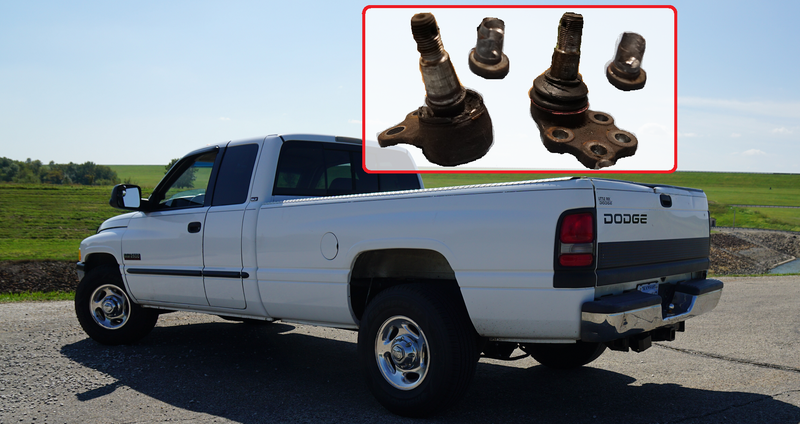 Some common ball joint configurations found in cars and trucks. When something is riveted, it’s sort of like the manufacturer saying to you, “This part isn’t replaceable at this component level, keep moving up the chain.” And “up the chain” in this scenario would mean replacing the whole control arm. That seems a bit unreasonable. Especially when you look at how much a new control arm costs, then multiply that by four to account for all the ball joints on the vehicle. Yikes! The more cost-effective measure is to replace the ball joints by removing the rivets that secure them to the control arms. The new ball joints can then be mounted to the control arms via bolts, which allow for serviceability in the future (imagine that!). This is what I elected to do, and I will now show you how to accomplish this mammoth-sized task. Not pictured: Pickle fork - get one of those too. The tools you need for this job are not too specialized. While it’s not in the picture, you will also want a pickle fork to separate the ball joints from the steering knuckle. This tool is best used when you do not intend to reuse the ball joints. This is because it will tear open the joint’s rubber boot. That wasn’t an issue for me because my ball joints were toast anyway. Be sure to get two or three of each of the assorted drill bits pictured above. Yes, it gets pricey, but trust me, you’ll use them. There will be a LOT of drilling in this job. Also, pick up a tungsten carbide Dremel bit to help correct any off-centered drilling that is bound to occur. This bit can cut through nearly anything. If you find that your drill holes are veering off center, this bit will allow you to grind your way back to where you should be. Lastly, get yourself the biggest bag of patience you can find. This procedure is going to take a bunch of the stuff. Now we can get to the real fun of removing riveted-in ball joints. The first order of business is to place a dimple in the middle of the rivet you will be drilling. This is accomplished with the center punch and a hammer. With a guide for the drill bit now present, it is time to start drilling. The only way to remove the rivet and not cause harm to the control arms is to drill out the center of the rivet. The center portion of these rivets is about 1/2 inch wide. That’s a lot of metal to get through. First, let’s start with the smallest drill bit we have. We want to drill down to a depth of about halfway through the rivet. Once we have a tunnel drilled with the smallest bit, each subsequent pass with a larger bit will go much more smoothly. I slowly progressed from one of the smallest drill bits I had all the way up to my 1/2 inch drill bit. Next, it was time to lop off the top of the rivet with the hammer and chisel. With the top removed, we’re more than halfway done extracting this rivet. Now we resume drilling. The objective this time around is to drill all the way through to the other side of the rivet. Start with the smallest bit first and progress your way up to the larger ones. Removing the “core” of the rivet will alleviate some compression within the piece, ultimately allowing it to be extracted. You’ll have a nice accumulation of metal shards by this point. The time has finally come to pound the rivet out of the control arm. Take a large drift punch and a sledgehammer and smack that piece of crap out of there. Be mindful of your hand that is holding the punch. You might also consider hearing and eye protection for this section. Following a few swift hits, the rivet is free of the control arm. Success! Now all that’s left to do is to repeat that process on the remaining 13 rivets! In case you were wondering, this is how weekends were meant to be spent. Fast forward a few hours (in my case, days), and you’ll have all the rivets punched out and the old ball joints thrown to the side. It’s time to get the new parts installed. New parts, including some tie rod ends - those will be a later job. Pay no mind to those jaw pullers. They didn’t work so well for this task. When you go through this much hell to replace parts, the last thing you want to do is throw in new parts that have questionable build quality. For me, MOOG ball joints were the only way to go. These should hold up well for a long time to come. It’s amazing how much faster everything goes back together compared to taking it apart. That’s just the convenience of using bolts instead of rivets upon reassembly. I quite literally had both sides of the truck back together in under two hours. With the new ball joints installed, I took the truck to a shop to have an alignment performed. This is a must whenever work has been performed on steering components such as ball joints. This procedure took me the better part of a weekend. A lot of that time was spent feeling my way through the repair. There were a lot of runs to the hardware store in order to get this job accomplished. This is certainly not something I want to do again any time soon. It was physically draining and at times emotionally taxing. I fully understand why many people elect to just replace the whole control arm on these trucks if the ball joints go bad. If money was no object, then I might have considered that. At the end of the day, the truck is now a lot safer because the suspension and steering systems are back in spec. With a vehicle as big and heavy as this Dodge Ram is, you definitely don’t want to leave something like ball joints to chance.